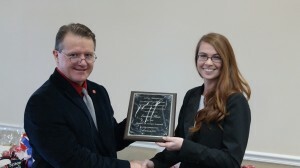 Legal Studies undergraduate Susan Shea was awarded the Linda Chitwood Student Merit Award at the 2015 Applied Sciences Career Fair. The only school-wide undergraduate award given by Applied Sciences, the merit award carries a $1,000 scholarship. Dean Velmer Burton presents Susan Shea with the award. Susan Shea is a senior Criminal Justice major with a minor in Intelligence and Security Studies. A number of her accomplishments and honors include the Golden Key National Honor Society, a Who’s Who Student in American Colleges & Universities, and a member of the Alpha Phi Sigma Criminal Justice Honor Society. She currently has a 3.64 GPA at the University of Mississippi. Dr. David McElreath, professor of Legal Studies, nominated Shea for the award. McElreath recognized the student’s successes inside and outside of campus.